This state-of-the-art office facility benefits from a prime location in the heart of Bonifacio Global City"s CBD and is supported by various amenities both within the centre and locally. 24-hour access, secure car parking, videoconferencing facilities, high-speed WiFi and a manned reception area are just some of the amenities available in this space, all within a few minutes walk of Raffles Place Setro Station. This iconic building has green credentials and is located at the heart of the country's CBD. A range of exceptional quality office suites are available, along with a host of business support services. Situated in a prime area of Bonifacio Global City, close to shopping malls and residential areas, this Green Grade A+ building offers a full range of business spaces, including suites, meeting rooms, pantry and much more. The IT infrastructure is second-to-none, and a full range of business support services is available to clients. This flexible office solution is located within a 48-story sustainable corporate tower that is located within Bonifacio Global City. The building is part of a mixed-use development considered one of the nation’s first certified green projects. This is the second tower to rise in the area, and the entire development was designed by Chad Oppenheim, a Miami-based architect who specialises in green architecture. Office space prices ranging from ₱7500 - ₱45000 per month. This space features co-working, private offices and meeting spaces. The penthouse rooftop offers fantastic panoramic views of the surrounding area. There is a barista-style coffee bar. High-speed WiFi will keep your business on the go. The interior is contemporary and stylish. Situated in hub of development and innovation, in Taguig City. It is a 15 minute drive to Guadalupe train station, and one minute walk to the nearest bus stop. close-by there are numerous shops, bars, coffee shops, fast-food joints and restaurants. In the vicinity, there are also a number of hotels. This is a unique opportunity of renting office spaces in an impressive building set in one of the most popular and dynamic business districts of Manila. These offices are provided with a full range of facilities and services to offer an ideal working environment. The business district hosts banks, international companies, luxurious hotels, shopping malls, the hospital and entertainment. This business centre is located on the 10th floor, and offers a selection of serviced offices. The building has many famous tenants, and is close to an excellent selection of amenities, including shops, banks and more. Housed on the top two floors of a 36-storey Bonifacio Global City Grade A building, this office space is surrounded by companies including Coca Cola and Sony while there are a variety of options to suit varying budgets. This serviced office centre is based in the heart of Alabang, where there is a huge focus on a live – work – play lifestyle. Are you looking for that perfect work-life balance? Then Alabang is for you. 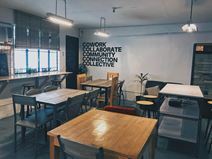 This co-working space allows you to work hard at building your business, but also allows you the flexibility of working on the go, or collaborating with local businesses from a variety of sectors, or even just taking the time to network and grow your professional relationships. Ideally situated in Times Plaza among major governmental and commercial entities, this corporate space is part of a complex serviced by a range of conveniences and with links to public transport hubs. Be part of this unique planned development in Manila. This is a mixed-used complex, which contains up-market condos, a convention centre and a major shopping centre, in addition to its office buildings. Major tenants moving their headquarters into the development include HSBC, Tetrapak, Fujitsu and Ericsson. This prestigious development will also include hotels and a food court. In this fully furnished centre you can find a dynamic community of influencers, creators, and thinkers. The space plays host to a variety of start-ups, freelancers, and entrepreneurs. There is a cafe/ restaurant on site and a well-equipped kitchen. For you convenience there are beverages, multilingual staff and 24-hour security. The space is located in a very sought after position as it is nearby to the upcoming LRT line (Emerald Station). You will be spoilt for choice with the wide variety of restaurants just moments from the centre. Also in the surrounding are, you can find convenience stores, ATMs and banks. This business centre is situated in strategic location near to Ayala Avenue and the Greenbelt Mall in central Manila. The centre offers both private offices and co-working office solutions which incorporate a vast array of facilities and services including an on-site receptionist on hand to answer calls, meeting and greet guests and handle mail. There are a number of restaurants and trendy bars nearby to unwind after work or entertain clients. Conveniently located in the heart of the Makati business district, and close to major corporations, hotels, restaurants and more, this brand new office tower provides stunning business accommodation across its 33 floors, along with excellent car parking facilities. This office space is well served by local amenities including the SM Megamall. It is located on the EDSA highway in Mandaluyong City and is ideal for local and international companies looking for flexible serviced office solutions. The interior features whitewash walls with splashes of bright colour. There are many of windows providing plenty of natural light. The floors are wooden and there are quirky light fittings. For your convenience there is dedicated internet, postal facilities, showers and training rooms. The centre aims to be as versatile as possible to accommodate what every client needs. Nestled in the San Juan neighbourhood, the centre is located in the Flossom place compound. This area is cozy, quiet and very welcoming. In the surrounding area, there are numerous eateries, shops and coffee shops. Sta Lucia Sports Complex is 1 minute's walk from the centre. There is also an ATM, supermarket and bank within 5 minutes' walk. This building is adjacent to a major shopping mall, and just a 15-minute drive from the International airport. This is a 10-storey office building, providing a range of office spaces to suit your business needs. Sharing a building with the Philippine Chamber of Commerce and Industry, this business centre is ideally located for networking opportunities. A range of flexible private suites and open-plan office space is available while the surrounding area is full of banks, shops, restaurants and hotels. Centrally located and conveniently serviced, this centre would be a prestigious address for any company looking to operate in the Philippines. The centre offers a sandwich service and contains a net café. The building is situated in Manila's premier business district, Makati City, and is nearby to the Philippine Stock Exchange, consulates and embassies, and prominent banks. Available for lease is office space in a modern, high-rise office tower in Manila. The building has a professional management team from a multi-national property management company, and features a private club, café and a general store. In the area are banks, restaurants, entertainment facilities, hotels and even a golf course. Located just 15km from the airport, this business centre is on the 19th floor of a 45-storey building that features a mix of office and commercial spaces. The centre is close to a variety of public transport options for great access to the rest of the city. The centre offers flexible office space that comes fully equipped with high quality furnishings and fittings and offers convenient access to a wide range of local amenities. In the heart of Mandaluyong city, this space offers tenants the opportunity to work in a PEZA certified building, conveniently located near EDSA, plus local hotels, restaurants, cafes and even shopping malls. Benefit from the proximity to these places, and gain the advantage of fibre-optic internet access, reception services, comfortable breakout and lounge space, plus the added benefit of 24-hour security. From a prime location opposite Powerplant Mall this notable office tower provides a mix of private and shared desk space as well as fully furnished and equipped executive suites, all with access to meeting rooms and a business lounge. Situated in the heart of Mandaluyong city's business district, this serviced office space delivers everything you could want in business premises. Benefit from amenities including high-speed secure internet and front-desk services such as guest welcoming, telephone answering and package sorting. The centre also benefits from sizeable events space - if you've got a conference or product launch to host, you can hold it here. These serviced and furnished offices are ready to move in to and start working from immediately. Located in the heart of Muntinlupa City, the professional and modern space has great transport links with Alabang station less than 1km away.